Bowling Green’s Brent Tate “should be playing Friday,” Falcon coach Chris Bergeron said. The junior forward missed BG’s last three games with a lower-body injury. Tate is one of BG’s most valuable players because of his scoring and physical presence, and his ability to play on the special teams. He has 15 goals and 18 assists in 53 career games. The Falcons, 3-1 overall, visit Clarkson (2-2) for a nonleague series. Faceoff is Friday at 7 p.m. and Saturday at 7:30 p.m.
“He’s had two good days of practice and 10 to 12 good days of therapy and strengthening,” Bergeron said Wednesday. Also for the Falcons, senior defenseman Connor Kucera won’t play this weekend, the result of a shoulder injury suffered last Friday at Alabama-Huntsville. 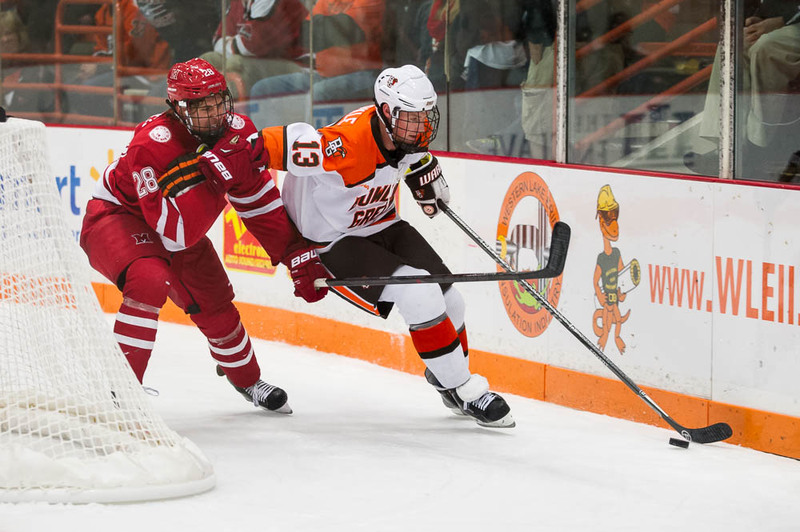 The 6-foot, 206-pounder gives BG a physical presence on the blueline and kills penalties. 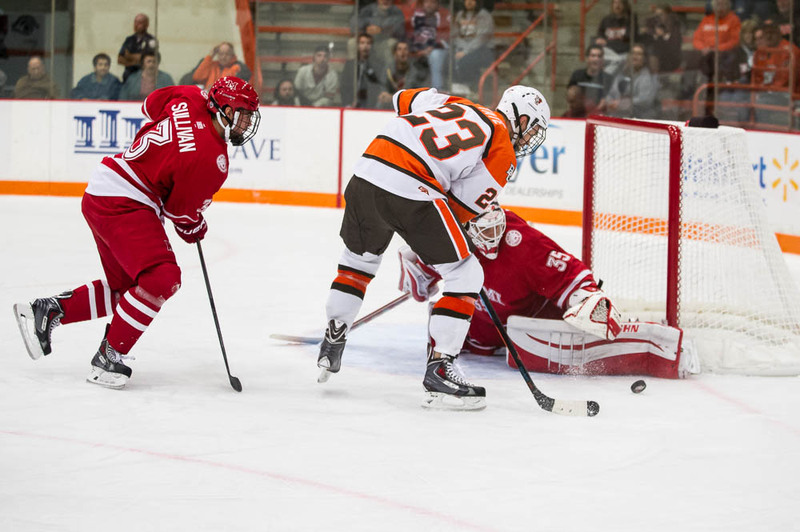 GOALTENDING: Junior Tommy Burke and freshman Chris Nell will start in goal for the Falcons this weekend as the team’s goaltending competition remains “a work in progress,” Bergeron said. Tomas Sholl will not make the trip. Each of the goalies will have made two starts after this weekend. Sholl has a 1.32 goals-against average and a .932 save percentage, and Burke stopped 26-of-29 shots in a 3-2 loss Miami. Nell made 20 shots in his BG debut, a 5-0 win over Alabama-Huntsville last Friday. He was the first Falcon goalie to post a shutout in his first start since Bob Petrie during the 1993-94 season. BERKLE/DESALVO: Although Berkle and DeSalvo have just one assist each, Bergeron is pleased with their play. Last season, DeSalvo had seven goals and 25 assists in 39 games, and Berkle totaled 10 goals and 11 assists in 34 games. Berkle and DeSalvo also skate on the power play, and they’re usually the first two forwards used to kill penalties. LEADERSHIP: Bergeron is pleased so far with the leadership of captain DeSalvo, and assistant captains Mark Cooper, Berkle and Tate. “Our leadership ground has done a nice job,” Bergeron said. “It’s their example every day. They’ve helped us get to where we are today. DeSalvo and Berkle are seniors, while Cooper is a junior. They’ve been regulars since joining the Falcons. Kevin joined BGSUHockey.com after wrapping up a 27-year run as the Falcon hockey beat writer for the Sentinel-Tribune. After providing another two years of the Falcon hockey coverage fans had grown to love over the past three decades, Kevin decided to hang up his notebook and is now enjoying the retired life. Please join us by sending Kevin a tweet and thank him for all the time he's dedicated to BGSU hockey: @KGordonBG.